The Best 3D Printing blogs from thousands of top 3D Printing blogs in our index using search and social metrics. Data will be refreshed once a week. Also check out Top 3D Printing Youtube Channels list for Top videos on 3D Printing. 2.67 3D Printing world from rainy Seattle. Three-Dimensional Printing newsletter is a comprehensive summary of the day's most important blog posts and news articles from the best Three-Dimensional Printing websites on the web, and delivered to your email inbox each morning. To subscribe, simply provide us with your email address. London About Blog We feature the latest 3D Printing news, from research to applications showcase, we cover the whole industry, the new 3D printers, materials, and events. Facebook fans 687,752. Twitter followers 100,315. About Blog 3DPrinting.com is for everyone interested in 3D printing, from hobbyist to industrialist. It offer quality news coverage and in-depth reporting, product information, and community content via a unified, modern platform. 3D Printing is taking the world by storm. Learn more about 3D printers and additive manufacturing companies on 3DPrinting.com. Facebook fans 31,560. Twitter followers 21,329. World About Blog 3Ders.org provides the latest news about 3D printing technology and 3D printers. Facebook fans 46,909. Twitter followers 50,557. New York, NY About Blog Shapeways is a creative community of makers, designers, technologist and entrepreneurs using digital manufacturing and 3D Printing, to bring their ideas to the physical world. It is the world's largest online 3D Printing Service, Community and Marketplace. Facebook fans 173,429. Twitter followers 356,476. About Blog 3DPrint.com is a news organization dedicated to bringing you up to date on all the latest news from the 3D printing industry. Facebook fans 268,530. Twitter followers 40,462. New York, NY - USA About Blog Adafruit was founded in 2005 by MIT engineer, Limor "Ladyada" Fried. Her goal was to create the best place online for learning electronics and making the best designed products for makers of all ages and skill levels. Find everything related to 3D printing here. Facebook fans 103,491. Twitter followers 149,503. Seattle About Blog I'm Joel, and I am YouTube's 3D Printing Nerd. I use my channel to discuss and review 3d printers, I show how to 3d print models, and I advocate for this technology to get into the hands of kids! Facebook fans 24,014. Twitter followers 13,596. Munich, Bavaria About Blog Your dedicated resource for all things 3D printed. Compelling content for absolute beginners and experienced pros. Educational, accessible and entertaining. Facebook fans 92,691. Twitter followers 3,433. Cambridge, MA About Blog Formlabs spun off from the MIT Media Lab in 2011 to develop a high quality, low cost 3D printer that enables designers and engineers to create 3D forms with the touch of a button. Stay updated with the latest 3D printing news, including interviews with makers from around the world and tutorials on how to make better 3D models. Facebook fans 58,135. Twitter followers 18,490. Leuven, Belgium About Blog i.materialise is an online 3D printing service, community and marketplace for creative people. It is a 3D printing blog that keeps you updated about outstanding 3D designs, the newest 3D printing technologies and the best 3D modeling software tutorials. Facebook fans 52,108. Twitter followers 22,495.
based in San Francisco & Paris About Blog The sculpteo blog delivers the latest news and trends about 3d printing. You'll find information about the latest 3d printing technologies, 3d files, tutorials and the best 3d modeling software. Facebook fans 7,116. Twitter followers 12,545. About Blog DEVELOP3D is a print and digital resource which tracks the essential technologies used throughout the entire product development process. DEVELOP3D analyses and disseminates emerging technologies whilst engaging engineers and designers and assisting them in their increasingly complex software and hardware selection process. Facebook fans 6,048. Twitter followers 11,235. San Francisco, CA About Blog News, information, links and fun things related to 3D printing, 3D printers, rapid manufacturing, desktop fabrication etc. Facebook fans 1,093,719. Twitter followers 476,670. About Blog XYZprinting, a New Kinpo Group company. We are dedicated to bringing cost-effective 3D printing to consumers and households around the world. With proven industry expertise and an innovative spirit, XYZprinting is poised to break down the barriers of 3D printer ownership by providing an easy-to use-device that delivers an outstanding user experience. Facebook fans 118,029. Twitter followers 3,472. Mountain View, CA About Blog Comprehensive up-to-date coverage for 3d printing, aggregated from news sources all over the world by Google News. Facebook fans n/a. Twitter followers 213,001. Prague About Blog PrusaPrinters.org is community website for all Prusa 3D printer owners or fans. You can watch many interesting interviews, guides and use our amazing Calculator. Facebook fans n/a. Twitter followers 10,198. About Blog MakePrintable.com created by Mixed Dimensions is a cloud solution that analyses and repairs any 3D model for 3D printing. Their vision at MakePrintable is streamlining the process between 3D content and 3D printing. Their platform is for 3D hobbyists, makers and 3D enthusiasts who use 3D printing in their workflow and don't want to spend their time repairing wall thickness or solidity issues. Facebook fans 2,747. Twitter followers 780. Facebook fans 4,874. Twitter followers 15,943. Valencia, California About Blog A full library of articles with the latest information about 3D printing & advanced manufacturing, from technologies to applications to customer stories. 3D Printing and Advanced Manufacturing services to accelerate product development in a dynamically changing world. Facebook fans 14,712. Twitter followers 2,975. Miami, FL About Blog 3Dprinterchat.com offers a great site for those that want to learn more about 3D printing. Here you will find the latest news and reviews from the rapidly growing 3D print industry, plus answers to all the big questions about 3D printing. Their Bloggers will frequently add more content to the site Showing You reviews, How to´s and much more. Facebook fans 4,864. Twitter followers 5,649. Worldwide About Blog TCT Magazine is the cornerstone of The TCT Group's media arm, the world's premier communications portfolio for 3D technologies (3D printing, additive manufacturing, 3D scanning, metrology, 3D services, design and more) communities. Facebook fans 1,229. Twitter followers 8,424. Southern California About Blog Airwolf 3D is committed to manufacturing high-performance 3D printers that are fast, affordable, durable and easy to use. Stay up-to-date on the 3D printing news, including trends, tips and tricks, and 3D printing industry news from Airwolf 3D. Facebook fans 20,848. Twitter followers 5,031. Australia, New Zealand About Blog The UP range of desktop 3D printers are perfect for the office or mancave. Our Inspire line feature large build volumes, suitable for business and industry. The two Kevvox printers are DLP high resolution printers. Facebook fans 9,982. Twitter followers 1,029. About Blog A collection of guides, articles and reviews written for the Maker Select and Wanhao Duplicator 3D Printing community. Hennigsdorf (near Berlin) About Blog Founded in 2013, trinckle was the first online 3D printing service provider in Germany. Since then it has refined its expertise and built up its software platform paramate. trinckle equips its partners with the software to leverage the full potential of 3D printing and realize innovative business opportunities. Facebook fans 804. Twitter followers 442. Alphen aan den Rijn, Nederland About Blog Leapfrog 3D Printers was founded in 2012 when AV Flexologic, a Dutch manufacturer of machines for the flexographic industry, was in need of producing prototypes and unavailable spare parts for their machines. Leapfrog produces large, high grade and advanced 3D printers. Facebook fans 52,505. Twitter followers 7,881. About Blog Inside 3D Printing is the largest professional 3D printing and additive manufacturing event worldwide. As a conference attendee, you’ll explore the business applications of 3D printing through conference sessions led by industry experts, demonstrations of the latest 3D printers and services, and programming for designers, professionals, and makers. Facebook fans 13,659. Twitter followers 4,904. Facebook fans 2,096. Twitter followers 1,954. Massalombarda, RA About Blog WASP (World’s Advanced Saving Project) was created in 2012. A project focused on developing 3D printing and that finds its roots in the world of Open-source, trying to give and put into circulation know-how and tools. WASP manufactures solid professional printers with the aim to encourage sustainable development and in-house production. Facebook fans 10,489. Twitter followers 3,666. Minneapolis, MN About Blog MCAD specializes in sales, support and training of engineering productivity tools including 3D Solid Modeling, Design Validation, Product Data Management, Product Documentation and 3D Printing and Rapid Prototyping. These solutions utilize the market-leading technologies provided by SolidWorks and Stratasys 3D Printing. Facebook fans 24,547. Twitter followers 10,571. Barre, VT About Blog Filabot is a desktop extruding system, capable of grinding various types of plastics, to make spools of plastic filament for 3D printers. Recycles bad prints, makes filament from recycled plastic, and even use low cost pellets for new filament. Facebook fans 15,808. Twitter followers 3,022. Richmond, VA About Blog TriMech is the go-to-company for engineering resources, servicing the East Coast from Maine to Florida. They are partner with SolidWorks and Stratasys to provide you with complete solutions in 3D CAD/Simulation, Rapid Prototyping, Consulting and Personnel Placement. TriMech is your engineering resource providing complete SOLIDWORKS 3D CAD and Stratasys 3D Printing product solutions. Facebook fans 1,093. Twitter followers 1,869. London, England About Blog 3D Printing Business Directory has over 3,000 company pages, including addresses, telephone numbers, emails and social media pages, 3D Printing Business Directory is the most complete and up to date who's who listing for the global 3D Printing Industry. They aim to help connect 3DP/AM-related companies and their potential customers throughout the world. Facebook fans 1,520. Twitter followers 1,164. About Blog 3D Insider is a leading technology publication covering the latest news in topics such as 3D printing, drones, and virtual reality. Facebook fans 26,528. Twitter followers 3,051. United States About Blog Treatstock is an online platform for consumers to search and purchase anything that can be made on a 3D printer. All members of their team are enthusiasts of what they do and they are all, to some extent, carried away by 3D printing. Their main objective is to provide the most extensive range of 3D models for both unique and everyday items that can also be personalized to your liking. Facebook fans 1,393. Twitter followers 2,297. Boston About Blog NVBOTS 3D printer solutions offer the only automated part removal in the industry, enabling 24/7 operation for rapid prototyping and many industrial uses. Facebook fans 959. Twitter followers 1,305. Minnesota About Blog Afinia is a division of Microboards Technology LLC, a leader in specialized printing solutions. Their 3D printer line demonstrates our mechanical and electrical expertise. They offer the H-Series of 3D printers: portable, affordable plastics printers for design engineers, educators, and hobbyists. Facebook fans 1,780. Twitter followers 5,557. Brooklyn About Blog MakerBot is a global leader in the 3D printing industry. Founded in 2009 in Brooklyn, NY, MakerBot strives to redefine the standards for reliability and ease-of-use. Through this dedication, MakerBot has one of the largest install bases in the industry and also runs Thingiverse, the largest 3D printing community in the world. Facebook fans 99,417. Twitter followers 147,832. Netherlands About Blog As one of the world’s leading 3D desktop printer manufacturers, and the developers of Cura software, Ultimaker has its finger firmly on the pulse of major 3D printing trends and news. The world of 3D printing is always changing, so check out their range of videos to find out more about the latest innovations, 3D printing projects, and other juicy content. Facebook fans 139,011. Twitter followers 43,218. Hurricane, UT About Blog 3D Printing Professor does weekly upload of 3D printing, 3D modeling, cool projects, tutorials, do it yourself solutions, and family friendly fun. Facebook fans 634. Twitter followers 1,924. Fargo, ND About Blog Fargo 3D Printing was founded in 2013 as printer supplier and re-seller. They've grown since then, focusing on providing hard-to-find 3D printer replacement parts and have become the largest 3D printer repair facility in North America. Fargo 3D Printing provides 3D printing information, news, and tech tips from the people who know 3D printing best. Facebook fans 7,003. Twitter followers 1,054. Sydney, Australia About Blog Maker's Muse provides 3D Printing Reviews, Tutorials and Guides. They believe in empowering creativity through rapid prototyping technologies and take pride in providing unbiased and fair reviews of 3D Printers, 3D Scanners and Software. Facebook fans 3,308. Twitter followers 10,948. California, USA About Blog Make Anything is a YouTube channel Devin Montes has created to share his passion of 3D printing and design. Each video shares his experience working on a 3D design project, whether they're quick-fixes for problems around the house, or just something really cool and unique to 3D printing. His goal is to provide educational content and inspire viewers to exercise their creativity. Facebook fans n/a. Twitter followers 6,585. Framingham, MA About Blog The 3D printing and additive manufacturing and rapid prototyping department of Desktop Engineering, Rapid Ready Technology covers all the technologies that allow design engineers to make digital models into physical prototypes and products. Facebook fans 5,244. Twitter followers 2,943. Turnhout, Belgium About Blog Luxexcel developed a 3D printing technology which can print ophthalmic lenses. A globally unique technology which can print without the need for polishing. This 3D printing process offers the ophthalmic industry new possibilities. Luxexcel developed a turnkey 3D print solution for ophthalmic laboratories. This technology solution will offer a revolutionary new approach to lens manufacturing. Facebook fans 467. Twitter followers 4,257. Emmen, the Netherlands About Blog Innofil3D offers Premium Quality Filament for demanding 3D Printing Makers and Professional users. Follow this blog for news, tips & tricks, and events attended by Innofil3D. Facebook fans 595. Twitter followers 527. About Blog DIY 3D Printing is a community of 3D printing hobbyists and enthusiasts. Follow this blog for more 3D ideas, tips and tricks. Facebook fans 3,307. Twitter followers 1,959. Woburn, MA About Blog Rize Inc. patented Augmented Polymer Deposition 3D printing technology enables you to 3D print more iterations faster than any other method, improving designs and exponentially speeding your entire R&D process. their mission is to put a safe, industrial-grade 3D printer capable of 3D printing injection molded-quality parts in every engineer's office. Facebook fans 159. Twitter followers 574. New Delhi, India About Blog 3Dexter is one of the leading companies in providing experiential learning processes at the grass root level through 3D Printing Technology. 3Dexter undertake the responsibility to assist educational institutions to develop 3D Designing and Printing as a skill in young minds through curriculum based setups. Facebook fans 3,584. Twitter followers 40. South West of England - UK About Blog Richard's aim is to help others build technology and eventually a 3D printer of their own. He is an Electronics engineer who is highly interested in 3D printing. Facebook fans n/a. Twitter followers 4,554. San Francisco, CA, USA About Blog 3DHeals helps to facilitate collaborative innovations among design, engineering, and healthcare (medical, dental, bioprinting) industry using 3D printing technology. Berlin, Germany About Blog DimensionAlley is a 3D printing consulting and store. 3D printing service, printer and supply sales. 3D / CAD modelling and product development using rapid prototyping. 3D print events. Facebook fans 687. Twitter followers 312. Southern California About Blog Purple Platypus is the preferred dealer in the Southwestern United States who markets an extensive line of 3D printers by Stratasys Ltd., from the low-cost Desktop 3D Printers, all the way to 3D Production Systems for direct digital manufacturing. It is the preferred distributor for advanced 3D printers, benchtop milling machines, & direct 3D modeling software. Facebook fans 494. Twitter followers 751. Hemel Hempstead, England About Blog Nath042 is a blog by Nathan Jenkins. This blog is about Gaming, Tech and 3D Printing. Facebook fans 80. Twitter followers 647. About Blog 3Dfab print is the community for 3D fab and print solution providers; the community for 3D users and suppliers. It is an international community for 3D fabrication, 3D printing, and additive manufacturing. Facebook fans 3,240. Twitter followers 857. Banbury, UK About Blog Founded in 1975, Laser Lines is a leading supplier of quality lasers and accessories, 3D printers, rapid prototyping machines and vacuum casting systems. Facebook fans 56. Twitter followers 1,763. New Jersey About Blog Sam Westin has been in the media printing space for over 5 years and is an early adopter of 3d printing technology. He is excited to be a mere peon among the 21st century printing revolution! When not thinking up new things to print in multiple dimensions, Sam shares his thoughts on the industry here. About Blog 3D Print Manual is baically a 3D Printer in every home. Facebook fans 13. Twitter followers 27. About Blog Edditive is a 3D printing journey by James Novak. Philippines About Blog 3D2GO Philippines is the first company to offer end-to-end 3D printing services and other 3D services in the Philippines. From small to large scale, they expertise is manufacturing high quality custom 3D products. Facebook fans 7,780. Twitter followers 337. About Blog MakerTree 3D, LLC specialises in desktop 3D printer sales and service. MakerTree 3D, LLC is a reseller of 3D printers, 3D scanners, 3D printing materials and other related parts and supplies. CAD, 3D scanning and 3D printing services are also available. Follow the MakerTree 3D blog for the most up-to-date 3D printing news, promotions and new product/ service offerings. Facebook fans 1,654. Twitter followers n/a. United Kingdom About Blog For all your 3D Printing needs, from 3D printers to models. We are a team of people that want to bring new products all over the world be it from 3D printed creations to 3D printer innovations. And also 3d Printers Our goal with our own products are modular, user-friendly, reliable we aim to please we can make custom 3D printed Designs Canvas/ Models we also offer prototyping services. Facebook fans 422. Twitter followers 1,160. About Blog Cubify 3D Printing Fans & Fun is all about solving the problem people face if they don't have a 3d printer. New Delhi, India About Blog Morphedo Technologies Pvt. Ltd is an Additive Manufacturing/3D Printing services company that enables the customers to economically manufacture unique products thereby giving shape to their creativity. It is your Knowledge Partner for 3D Printing Technology. Facebook fans 6,817. Twitter followers 2,730.
coventry About Blog 3D Quick Printing offer's a 3D printing service that thrives on its low costs and fast efficient 3d printing, throughout the UK. 3D quick printing provides in-depth news about the 3D printing industry. Read about new 3D printing developments, 3D print equipment & 3D printing services. Facebook fans 985. Twitter followers 2,642. Sweden About Blog Blogger, speaker, designer, maker, Daniel does it all! Whether it´s improving ways to apply 3D printing to everyday life, or developing mesmerizing projects to showcase 3D printing – Daniel knows how to get the job done and always with a smile on his face. Facebook fans n/a. Twitter followers 4,214. 67. 3D Printing world from rainy Seattle. About Blog Everything that has to do with 3d printing and 3d printers. From the high end to the open source Reprap A Freemarket Anarchist. Calgary, Alberta About Blog Vote 3D is a website created by two Canadian business professionals with the purpose of promoting 3D Printer Technology on a larger scale. Vote 3D website dedicated to helping inspire the future of 3D Printing. Facebook fans 3. Twitter followers 594. 6526 south state street About Blog Imagine That 3D is a 3D Printing marketplace and community. They harness 3D Printing to help everyone make and share designs with the world, making product design more accessible, personal, and inspiring. Individuals can make, buy and sell their own products. Facebook fans 639. Twitter followers 1,263. About Blog CMS (Contents and Media Solutions) is a blog about 3d printing and its tips and tricks. About Blog 3D printing, design, travel and architecture worth sharing by Dirk Janssen. Oakland, CA About Blog Type A Machines designs and manufactures 3D printers and printing systems for manufacturing. Type A Machines, founded in 2012 by CTO Andrew Rutter designs and manufactures the industry leading Series 1 3D Printer. Type A Machines brings the future of manufacturing to the factories of today. Facebook fans 1,673. Twitter followers 1,793. Ambala, India About Blog 3D Printers India is your one stop store for all 3D printing solutions. They are the Authorized Pan India Distributors for UP 3D Printers and accessories. Facebook fans 844. Twitter followers 27. NORTH AMERICA About Blog The Proto3000 team is hard at work enabling companies to leverage 3D technology to be more competitive, capable, and efficient. They connect innovative minds with highly capable tools. Rapid Prototyping, 3D Printing, 3D Scanning, 3D Engineering. Hampshire, UK (PO9 1HS) About Blog Dream 3D are a specialist retailer of desktop 3D printers, 3D scanners and accessories from top brands such as Ultimaker, Zortrax and MakerBot. Every 3D printer they sell includes free training at their showroom in Hampshire, UK and unlimited support. They also offer a 3D printing service that gives you the opportunity to print on our 3D printers. Facebook fans 1,111. Twitter followers 1,780. Richmond, VA About Blog 3D Central have been 3D Printing since 2011, and they've turned their passion into Virginia's first 3D Printing store. They love Open Source Hardware and Software, and are always sharing their designs with the community. Facebook fans 1,890. Twitter followers 528. Michigan About Blog Chuck Hellebuyck shows how to design 3D prints and then how to print them on lower cost printers. He also occasionally do new printer reviews, some electronics and CNC on my XCarve. Facebook fans 215. Twitter followers 3,214. About Blog 3D Printing Lab uploads video tutorials that often have been helping thousands of people learn the skill of 3D printing and sometimes even the experts in this field get to fix their printers by watching the videos uploaded by him. He uploads videos on how to use your 3D printer and how to handle the issues that arise in different models of 3D printers. Facebook fans 642. Twitter followers 631. Malta, Europe About Blog 3D Maker Noob is fascinated by everything related to 3D Printing. Follow this channel to know more about his journey into the 3D world. Facebook fans 295. Twitter followers 4,440. About Blog 3D is my thing. Anton loves making 3D Printing videos and believe videos are a great way of showing you, the viewer how something works. In his case he just loves to create videos and when he combines that with his interests in 3D-printers, 3D-scanners and other cool 3D-tech the end result should be quite entertaining and fun to watch. About Blog Fugatech 3D Printing is all about 3D Printing, Computer Modding and Reviews. United States About Blog Print 3D Channel is the home of all Jeffrey's 3D printing adventures, featuring the gCreate gMax 1.5XT , with a huge build space of 16"x16"x21", the printer can produce just about any project. This channel is dedicated to sharing all the fun of 3D printing and learning as we go about printers, filaments, electronics and everything else you can think of relating to the 3D printing world. About Blog For more than 25 years, Stratasys has been a defining force in 3D printing and additive manufacturing - shaping the way things are made. Stratasys 3D printing solutions enable better designed products to be delivered faster. Stratasys subsidiaries include MakerBot and Solidscape. Facebook fans 82,417. Twitter followers 38,114. United States About Blog Print That Thing is where we share 3D Printing designs, Tutorials, & Tips with the rest of the world. Hopefully educating & inspiring you to get involved with 3D printing. It is a place to watch 3D Printed Time Lapses, Creations, Tutorials, and other fun films. About Blog Mcor Technologies Ltd is an innovative manufacturer of the world’s most affordable, full colour and eco-friendly 3D printers. Mcor Technologies printing can also be used for 3D modeling and rapid prototyping. They are the only 3D printers to use ordinary business-letter paper as the build material, a choice that renders durable, stable and tactile models. Facebook fans 2,066. Twitter followers 14,747. Exton, PA About Blog Profound3D is a e-commerce site owned and operated by Media Supply, Inc. Their company has been in business since 1986, providing printing solutions and supplies to government agencies, business large & small, and individuals. 3D printing solutions, including 3D printers, 3D print filament, educational packages, accessories for classroom, office and home use. Facebook fans 209. Twitter followers 236. Brooklyn NY About Blog 3D Brooklyn is a modern manufacturing company in Brooklyn, New York. We offer product design, injection molding and 3D printing services in NYC. Facebook fans 1,162. Twitter followers 370. New York, USA About Blog The go to place for 3d printer filaments, including PLA, ABS, Nylon, Flexible, Carbon Fiber, Stainless Steel and other composite materials for 3d printing. As the role of 3d printing grows in academia, industry and education, we strive to provide knowledgable and affordable access to the technology for their customers. Facebook fans 17. Twitter followers 125. About Blog A blog about different 3D prints miniature design ideas and different design examples. About Blog 3D Print Club is a blog about collecting 3D Printer, 3D Pen and more. Los Angeles About Blog Mold3D is a site dedicated to artists who share an interest in emerging technologies and want to learn how to master these exciting mediums. Mold3D provides educational and entertaining videos for artists interested in 3D Printing, 3D Modeling, design and digital manufacturing topics. Facebook fans 18,992. Twitter followers 1,265. Milton Freewater, OR, USA About Blog ProtoParadigm was founded in 2011 to serve the newly emerging field of Personal 3D Printers, or personal rapid prototypers. Their goals are to provide you with information and resources so you may fully utilize this life-changing technology; as well as researching new and innovative materials that expand the potential and capabilities of what your 3D Printer can create. Facebook fans 423. Twitter followers 273. Cincinnati, OH About Blog Polar 3D offers the leading affordable, reliable, cloud-connected 3D printing solution designed for educators and consumers. The Polar Cloud is an online social platform that allows educators to share their curriculum and encourages students to collaborate on projects. Facebook fans 1,067. Twitter followers 1,395. Utrecht, The Netherlands About Blog 3devo develops high-end and consumer-friendly filament extruders for the 3D-printing market and Plastic Processing industry. Facebook fans 556. Twitter followers 349. About Blog 3D Universe is all about exploring the art of 3D printing and related technologies. Facebook fans 49,637. Twitter followers 812. Florida & Colorado About Blog Becoming 3D is a leading consultant & provider of 3D printing design-to-manufacturing solutions including 3D printers, print materials and supplies for businesses, schools and the hobbyist. Facebook fans 1,807. Twitter followers 551. West Palm Beach, FL About Blog Halo Technologies is the premiere 3D Scanning and 3D Printing provider in South Florida. At Halo Technologies, they are passionate about bringing 3D printing to the forefront of our industry. They are a diverse and driven team of engineers, entrepreneurs, students and marketers that realize the potential of additive manufacturing, not only in the manufacturing arena. Facebook fans 803. Twitter followers 321. About Blog My 3D Concepts, LLC exists to help you navigate and purchase the right 3D printing and scanning technology for your goals. My 3D Concepts provide 3D Printing Education, Consulting, 3D Design, 3D Printing Service & Sales. Facebook fans 2,796. Twitter followers 838. Shenzhen, China About Blog Torwell provides top quality 3D printers, such as ABS, PLA, HIPS, Nylon, Conductive, PETG, Flexible & Wood filament etc, to fit almost all 3D printers. 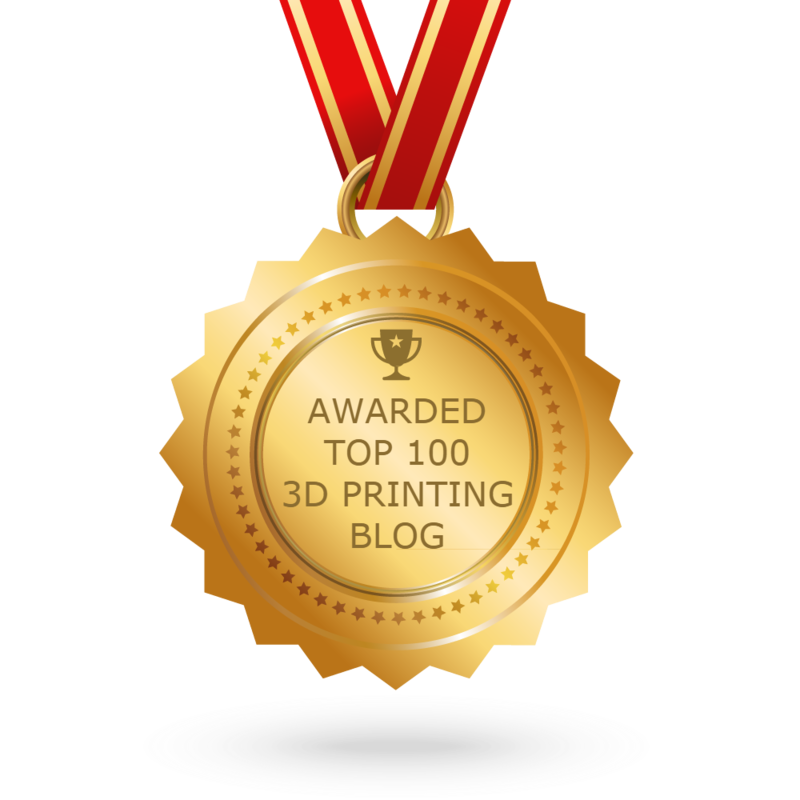 CONGRATULATIONS to every blogger that has made this Top 3D Printing Blogs list! This is the most comprehensive list of best 3D Printing blogs on the internet and I’m honoured to have you as part of this! I personally give you a high-five and want to thank you for your contribution to this world.